Which brings us to Canadian Prime Minister Justin Trudeau, who visited the White House today. 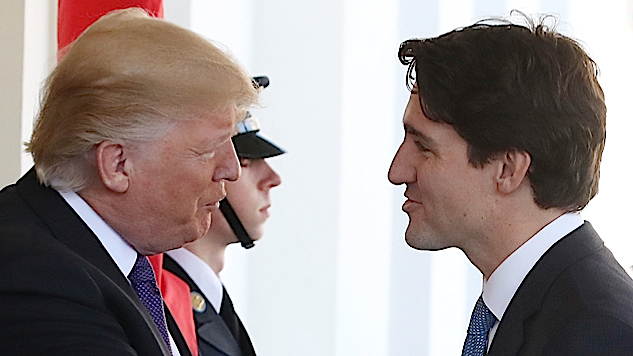 As he approached, Trump was ready with a wolfish grin and an outstretched hand, and Trudeau looked small and vulnerable—like prey. He started off brilliantly by closing the distance between himself and Trump, meaning that if the president tried to pull him forward, the two would collide—mutually assured destruction. Immediately, he took away his opponent’s greatest strength. Then he engaged Trump in a shoulder grab—a total power move that Trump countered with a shoulder/neck grab of his own. As the two men grimaced at each other, Trump created some distance and went back to old faithful: The grip-and-yank. If you look closely at the 4-5 second mark, Trump tries to tug Trudeau’s arm toward him, but for the first time since he took office, his opponent was ready: Trudeau held firm, resisted the yank, and held his ground beautifully. Finally, Trump tried to squeeze the hell out of his hand and go over the top for leverage, but Trudeau wouldn’t budge. The president gave it one more try, to no avail, and at the 7-second mark he ran out of gas. After exchanging a meaningful look with Trudeau, as if to recognize a worthy adversary, he dropped the Canadian’s hand and beckoned toward the cameras.